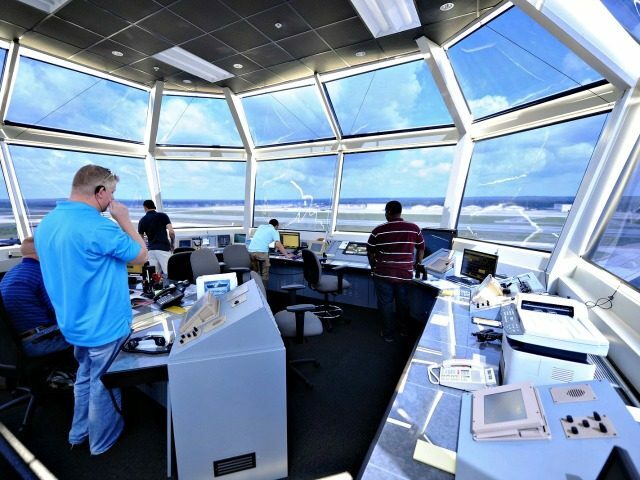 5 Jun 2017 Washington, D.C.
WASHINGTON, D.C. — Standing at a podium in the a packed White House East Room on Monday, President Donald Trump announced a new initiative to modernize the air traffic control system, which he them promptly signed. “Welcome to the beginning of a new era for American infrastructure,” Vice President Mike Pence said as he welcomed the crowd ahead of President Trump’s address. Pence highlighted the 600,000 jobs created since Trump took office, then added that the American people hired a “builder” as President. He said this new infrastructure initiative follows through on another campaign promise and will contribute to safety. “As I can attest from first hand experience, having more precise landings in America is a good thing,” Pence joked in reference to when his campaign plane skidded off a runway at New York’s Laguardia airport. President Trump then took the podium to speak of what he said would bring the FAA (Federal Aviation Administration) into the modern era. “Today we’re preposing to take American air travel into the future, finally, finally,” said Trump. After many years and billions of tax dollars, the system is “stuck” with a horrible, broken, antiquated system, according to Trump. The initiative proposes new reforms to congress. Trump said this reflects what air traffic controllers want. He pointed out unions and cargo companies present that support his initiative including a new framework and bidding process. Every former FAA chief and COO and three transportation secretaries “stand with us today,” said Trump. “It’s a coalition for change,” he added. This plan would create a nonprofit entity that would not need taxpayer money. The FAA will focus on “safety,” said Trump. A new nonprofit entity will be “charged with ensuring route efficiency, timely service, and a long awaited reduction in delays,” he said. The plan will maintain support for rural communities, according to Trump. He said they studied several other countries’ plans. Referencing one in particular, but not naming the country, he said the U.S. system under this plan will be better. “The new technology, and i’ve seen it, is incredible,” he said. Trump touted, “cheaper, faster, safer travel” under the new plan. He went on to mention Canada’s system. “Today we are taking the first important step to clearing the runway for more jobs, lower prices, and much much much better transportation,” said Trump, pointing out that the U.S. pioneered air travel. Transportation Secretary Elaine Chao echoed the President with expectations of a much improved air traffic control system. Chao then introduced Chairman of the House Transportation Committee Bill Shuster. Shuster spoke of modernizing the system as he held up three strips of paper to demonstrate one low tech way controllers currently use to communicate. He said the users of the system will be in control of managing it. Director of National Economic Council Gary Cohn then took the podium. He thanked the former DOT Secretaries for participating in the event. He said the current great safety record will continue. He said he looks forward to working with everyone gathered to quickly implement the plan. White House officials told reporters ahead of the announcement that the new plan upends a portion of Shuster’s plan, as the new plan implements a 13-member board. Eight members of the board under the new plan will be selected, made up of two members to represent airlines, two to represent unions, one to represent general aviation, one to represent airports, two to represent government as a whole. These eight members would, along with the CEO, select four additional independent members. The official said that the board would not be divided up by special interest groups. Congress will empower the board to do some things and prohibit them from doing others. During Trump’s East Room address on Monday, he briefly pivoted to speak about veteran services and moves toward “far better quality care” for military veterans.